SGI Alpha-1 Lucerne – The King of Forage. SGI Alpha 1 lucerne was bred from Australian, USA and Argentinian germplasm and was selected for increased winter activity, fast establishment, and finer stems with high leaf to stem ratio and improved disease and pest resistance. The increased leaf to stem ratio will also give higher protein and digestibility. SGI Alpha 1 displays strong autumn and winter/spring growth with vigorous recovery from cutting or grazing, this is an advantage in close grazed pastures and intensive forage cutting programs. 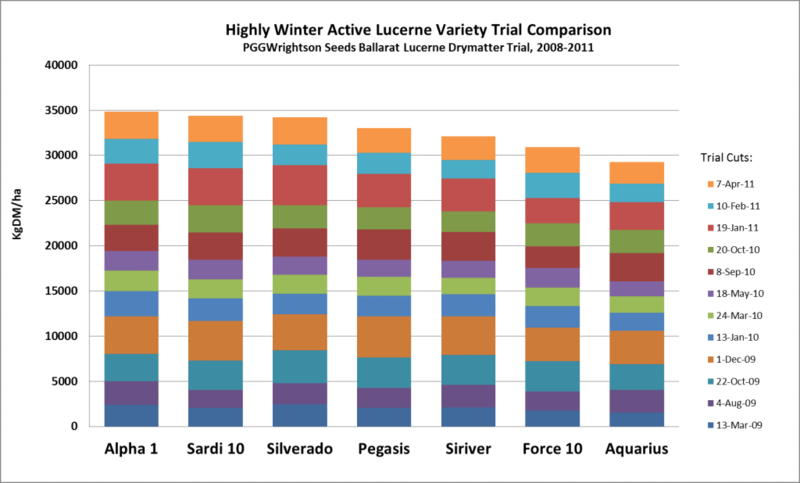 A replicated independent dryland lucerne trial, (shown below), conducted at Ballarat in Victoria showed SGI Alpha 1 as one of the best yielding varieties during a period of extreme dry conditions. Alpha 1 is suited to dryland or irrigated Lucerne growing areas with the following disease ratings. Being highly winter active, Alpha 1 can be sown through the early winter to early spring period and is suitable for under sowing cereals or as a rotation crop. Plan for weed and pest control in year prior to sowing e.g. crop paddock prior to sowing lucerne.